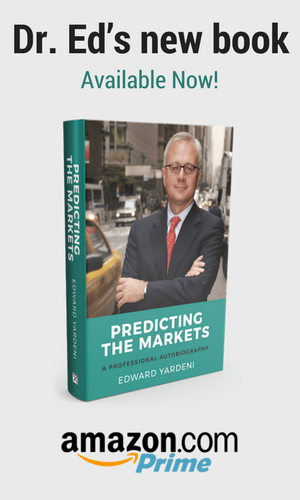 This seven-part series is excerpted from Chapter 8 of my book, Predicting the Markets: A Professional Autobiography. WITH THE FINANCIAL crisis rapidly spreading during September 2008, US Treasury Secretary Henry Paulson proposed a plan under which the Treasury would acquire up to $700 billion worth of MBSs to relieve banks of these toxic assets. Only three pages long, the plan was called the “Troubled Asset Relief Program” (TARP). A longer version became the formal legislation enacted on October 3. Just 10 days later, at a meeting with nine major US banks on October 13, TARP was changed. It became a program in which the Treasury would purchase individual banks’ preferred shares to inject capital into the banking system. Some of the bankers initially balked at the switch, but Paulson made them an offer they weren’t allowed to refuse. More reassuring than TARP, which was poorly planned and executed, was the FDIC’s Temporary Liquidity Guarantee Program, implemented on October 14. It fully guaranteed all noninterest-bearing transaction deposits at participating banks and thrifts through December 31, 2009. The deadline was extended twice and expired on December 31, 2010. In addition, the FDIC guaranteed certain newly issued senior unsecured debt of the banks. At its peak, the guarantee covered $345.8 billion of outstanding debt through the end of 2012. Sheila Bair, FDIC chair at the time, deserves credit for her role in ending the crisis. • Liquidity facilities for financial institutions. The first set was closely tied to the central bank’s traditional role as the lender of last resort for financial institutions. In addition to the Fed’s discount window, the traditional facility for distressed banks, these facilities included the Term Auction Facility, Primary Dealer Credit Facility, and Term Securities Lending Facility. Credit swap agreements were approved on a bilateral basis with several foreign central banks to relieve liquidity problems arising in global bank funding markets. • Liquidity facilities for borrowers and investors. A second set of tools targeted distressed borrowers and investors in key credit markets, including the Commercial Paper Funding Facility, the Asset-Backed Commercial Paper Money Market Mutual Fund Liquidity Facility, the Money Market Investor Funding Facility, and the Term Asset-Backed Securities Loan Facility. Collectively, the Fed’s emergency loans rose from $391 billion during the first week of September 2008 to peak at $1.7 trillion during the week of December 10. QE1 from November 25, 2008 to March 31, 2010. The first round entailed the purchase of the direct obligations of housing-related GSEs—Fannie Mae, Freddie Mac, and the Federal Home Loan Banks—and MBSs backed by Fannie Mae, Freddie Mac, and Ginnie Mae. Over the next several quarters, the Fed would purchase up to $100 billion in GSE direct obligations and up to $500 billion in MBSs. The program was expanded on March 16, 2009 to include purchases of $300 billion in US Treasuries. Under QE1, the Fed purchased $1.5 trillion in bonds, including $1.2 trillion in US Agency debt and MBSs and $300 billion in US Treasuries. QE2 from November 3, 2010 to June 30, 2011. The second round entailed the purchase of $600 billion of longer-term Treasury securities by the end of the second quarter of 2011, a pace of about $75 billion per month. Under the program, the Fed purchased $826 billion in US Treasuries, while its holdings of US Agency debt and MBSs declined $246 billion as securities matured. QE3 from September 13, 2012 to October 29, 2014. The third round was open-ended, with the FOMC committing to purchase $40 billion per month in Agency MBSs. No total was announced, nor was a termination date. On December 12, 2012, the program was expanded to include $45 billion per month in “longer-term” Treasuries. On December 18, 2013, QE3 was tapered to $35 billion per month in MBSs and $40 billion per month in Treasuries. It was terminated on October 29, 2014 after the Fed had purchased $832 billion in MBSs and $808 billion in Treasuries. Ben Bernanke had transformed the Fed into “Feddie,” supplementing and shoring up Fannie and Freddie. Because of the three rounds of QE from November 25, 2008 through October 29, 2014, the Fed’s holdings of MBSs increased from zero to $1.8 trillion, and the Fed’s holdings of Treasuries increased from $476 billion to $2.5 trillion. Not widely recognized is that the Fed stepped in to buy Agency- and GSE-backed MBSs because overseas investors were bailing out of these securities. Their holdings soared from $264 billion during the first quarter of 2000 to a record high of $1.6 trillion during the first half of 2008. By the end of the fourth quarter of 2014, when the QE program was terminated, they had dumped $734 billion of their holdings. Some of the foreign holders were central banks parking their international dollar reserves in these securities because they yielded more than US Treasury securities and were deemed to be just as safe. There wasn’t much the Fed could do for the ABS issuers directly. However, the Fed’s purchases of Agency- and GSE-backed MBSs certainly propped up these financial institutions and the underlying mortgages they held. Feddie had saved the day. It was also a new day for central banks following the financial crisis. The Fed and the other major central banks evolved into central monetary planners, essentially grabbing more power to manage the economy via monetary policy—with tremendous consequences for the major capital markets around the world. “How the Bailout Bashed the Banks,” Fortune, June 22, 2009. The Financial Crisis Inquiry Report, p. 142. “Temporary Liquidity Guarantee Program,” FDIC factsheet. “Credit and Liquidity Programs and the Balance Sheet,” Federal Reserve Board webpage. “Chronology of Fed’s Quantitative Easing,” YRI webpage.